Michael Tilley serves as Chair of the Vocal Coaching and Accompanying division in the School of Music. 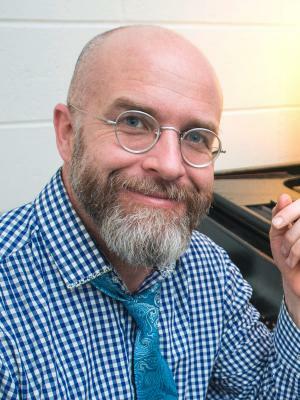 After receiving his Master's in Collaborative Piano from the University of Colorado-Boulder (also bachelor’s degrees in piano and molecular biology), Prof. Tilley was hired as Musical Director for Franc D'Ambrosio's national tours. During the last number of years, he has served as music director for concerts and shows in New York City and throughout the country. As a conductor, he has led ensembles from Central City Opera, Opera Colorado, Emerald City Opera and Boulder Opera. He has been a featured performer with the Colorado Symphony Orchestra and other regional orchestras, as well as with the Martha Graham Dance Company at the Vail International Dance Festival. His orchestrations and arrangements, from solo piano to full symphony to rock opera, have been heard across the country and abroad. He has also composed music for the stage and a feature-length soundtrack. He plays sings and writes for the Argentine Tango groups Extasis and Orquesta Tipica di Natural Tango.